Human milk is the best food for newborns and infants for its combination of nutrients and biological complexity that allows the healthy grows and development of the infant. These components could be affected by thermic treatments of conservation as heat pasteurization, used in Human Milk Banks. The aim of this study was to evaluate the effects of different treatments applied to human milk in its biological activity (antiradical scavenging and anticancer properties). Human milk was heat pasteurized, also submitted high pressure and after it was spray-dried. 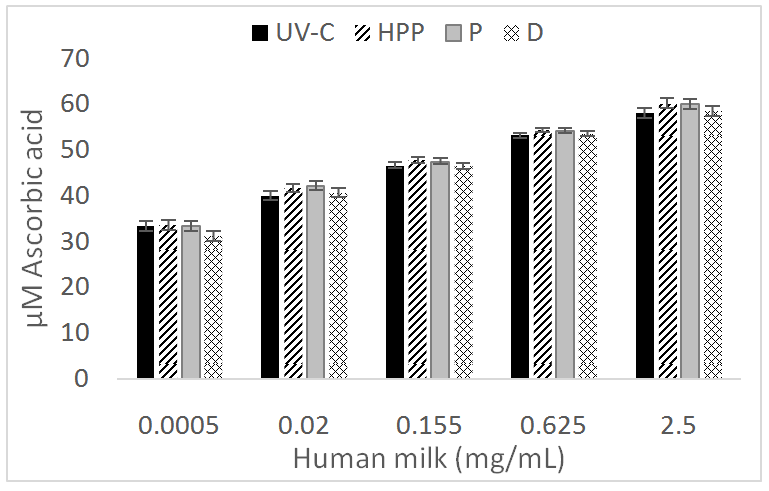 Moreover, of UV-C or γ- irradiation was applied on spray dried human milk. HT-29 cell line was used for testing antiproliferative assay. The results of this essay showed that 1.25 mg/mL of human milk treated with high pressures and spray dried can attain CI50. Human milk powder treated with γ-irradiation showed the highest inhibition activity of HT-29 cell line, and the pasteurized and spray dried human milk presents the lowest inhibition activity (p<0.05). The highest percentage of scavenging activity against the superoxide anion was in spray-drying treated with γ-irradiation, showing significantly higher activity against the O2 anion as compared to all other treatments tested (p<0.05), followed by human milk powder treated by UV-C irradiation, high pressure and heat pasteurization. Human milk powder treated by High pressure showed higher antioxidant activity, however, the value was not significantly higher as compared to the other pasteurization treatments evaluated (p > 0.05). 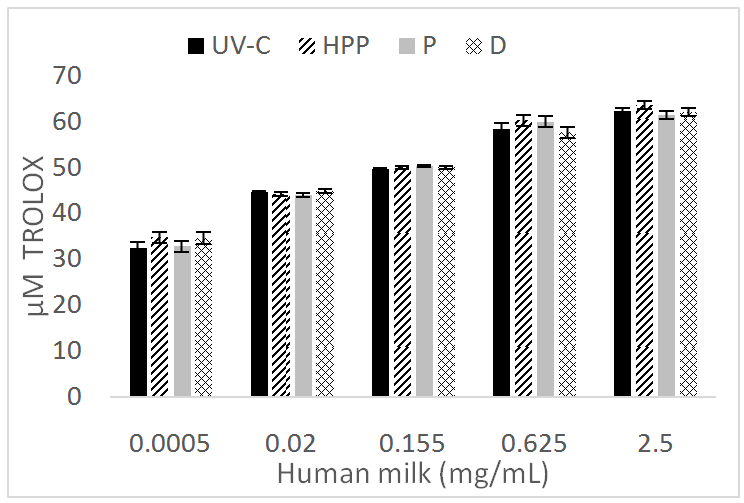 Spray-dried human milk treated with high pressure, UV-C and γ- irradiation conserved its biological activity, thus it’s could be possible to apply this technology in Human Milk Banks for conserving it. Scientific studies have demonstrated the superiority of breast milk because it provides health benefits for newborn infants and, due to its nutritional qualities, it is considered the ideal irreplaceable food during the first six months of life, with subsequent addition of complementary foods for 2 years or more 1, 2, 3. According to the World Health Organization 4, human milk reduces infant mortality and has health benefits even in adulthood. It recommends exclusive breastfeeding during the first six months of life, without other food or drinks, and after this period, and up to two years, to reinforce it with complementary foods. It suggests initiating breastfeeding during the first hour of life and thereafter when the child demands it, either day or night without using bottles, teats or pacifiers. The benefits of breastfeeding for the mother and child are biological, psycho-affective, economic and social. In addition, it has been found that there are differences between newborn infants fed breastmilk and formula; it has been documented that children fed with human milk have a higher Intelligent Quotient compared to those fed cow's milk, it offers protection against respiratory and gastrointestinal infections, and there is a lower incidence of infant mortality 5. Human milk has a unique composition that provides newborn infants with all essential nutrients such as proteins, fats, carbohydrates, minerals, vitamins, and physiologically active substances. Its constituents are distributed in several compartments: an aqueous phase with substances in solution (87%), colloidal dispersions of casein molecules (0.3%), emulsions of fat globules (4%) and fat globules in membranes and living cells (8.96%) 6. Lipids appear to be the most variable macronutrients since they are present in accordance with maternal nutrition 7. Human milk contains long chain polyunsaturated fatty acids, mainly arachidonic (0.44g/100g fat), docosahexaenoic (0.30 g/100g fat) and alpha-linolenic (0.12g / 100g fat) acids 8, 9. This lipid content is important because it has been shown that fatty acids, and in particular unsaturated fatty acids, have nutraceutical functions 10, 11. Human milk provides several benefits to children because it enhances neurological development and antioxidant defenses against hydroxyl radical aggression. It protects against respiratory illnesses, diarrhea and urinary tract infections, reduces the risk of both necrotizing enterocolitis (by about 79% when compared to formula milk use), and other diseases typical of childhood, and also prevents obesity 12, 13, 14, 15, 16. Due to the importance of feeding human milk to infants, Human Milk Banks (HMB) have been created to provide donor milk, in order to support those children whose mothers for some reason outside their control cannot feed them, this being a safe alternative for the infant, instead of the use of infant formula. However, despite the existence of the HMB, their supply capacity is very limited, because the processes of conservation (pasteurization and freezing) do not guarantee the sanitary or nutritional quality of this food for long periods of time 17. The most common procedure used for the conservation of milk is thermal treatment, including heat pasteurization, that involves an effect on microorganisms but which also could affect its nutritional value. However, in the case of human milk, other types of preservation procedures 18, the principal is refrigeration, where fresh breast milk can be refrigerated for 96 hours. After this period, it is not advisable to consume it since total protein could decrease and free fatty acids increase 19. The milk, once stored, must be frozen as soon as possible, as it is said that only in this way can its properties be preserved. Kept in an airtight container and frozen at -18°C, the milk can be stored more than 4 months. After this period, the needs of the baby will be different and the nutrients of the milk are not guaranteed 4. Sometimes is used freeze drying or cold dehydration as a conservation method for storing human milk, avoiding microbiological contamination and preserving its antibacterial properties. It is a process used in the pharmaceutical industry to maintain the active chemical properties of fluids and sensitive compounds 20. UV-C radiation is a cold treat method used by food industry, UV-C radiation is used to disinfect water, either to be marketed as such or in the beverage industry; also, as it does not leave chemical residues that can affect the life of animals, it is used to disinfect process waters, for example, water used during the transportation of fish to hatcheries or for water and in the disinfection of the water resulting from the purification of mollusks. It ensures a high reduction of microorganisms without altering smell, color or pH and increases the shelf life of fruit and vegetable juices 21.
γ-Irradiation is another cold treatment used for sterilization, the energy released could be very similar or identical to the radiation produced by an X-ray machine, which is produced from certain unstable materials called radioactive materials. The food is placed inside an irradiator equipped with a 60Co source protected by a dense wall of cement and the food move around the 60Co source 22. Some studies have suggested High-pressure processing (HPP) as a new cold process for cold pasteurization of breast milk 23. There are two general principles on which the application of high pressures is based: 1) the isostatic principle and 2) Le Chatelier’s principle. The first principle establishes that pressure changes are practically constant and uniform, regardless of the volume and geometry of the sample. The second postulates that any phenomenon that is accompanied by a decrease in volume is supplemented by pressure, and vice versa 24. Heat pasteurization is a thermal treatment that is applied to extract human milk whose objective is the inactivity of the most thermo-resistant microorganism, Coxiella burnetii. The HIV virus is inactivated at 56°C for 30 minutes, therefore pasteurization at 62.5°C for 30 minutes guarantees a high degree of virus inactivation. The applied temperature is aimed at guaranteeing 100% inactivation of pathogenic microorganisms and 99.99% of saprophyte microbiota. After 30 minutes, the milk is subjected to a rapid cooling at 5ºC 17. Spray drying treatment is used to eliminate the water constitution in milk, leaving a maximum of 5% of water, where 95% corresponding to proteins, lactose, and fat, mineral salts, etc. This milk is more stable than fresh milk, it could be store at room temperature but it’s necessary to preserve it from humidity, oxygen, light and heat. The whole milk powder contains 26% of fat by weight, thus it’s possible to conserve it until six months at room temperature, after that, the oxidation of unsatured fat content is so high that it could deteriorates easily 25, 26. In the process of spray dryer, there is a simultaneous exchange of heat and mass between the air of the drying environment and the solid and a liquid or suspension atomizes a stream of hot gas to obtain a shower of fine droplets. Water evaporates rapidly from said droplets, and dry particles of solid are obtained which are separated from the gas stream. The flow of gas and liquid from the spray chamber can be countercurrent, in parallel or a combination of both thus, if it’s possible to conserve milk formulas through this process, it could be an option for human milk, which it’s necessary to preserve its quality in HMB, and offer a fresh product preserving its nutrients and it's biological activity 27. Recent reports on the heat pasteurization, freeze-drying and spray drying of human milk, mention that the processes of drying and pasteurization, do not affect the total fat content, nor significant changes was observed in the fatty acids profile 28. Nonetheless spray drying can decrease the content of immunoglobulins mainly the IgA, the most sensitive in the human milk during of drying processing. But it is possible to retain IgA 76.37 %, IgG 81.65 %, and IgM 83.80 % 29. The processes of pasteurization and drying of human milk separated or together, provide the advantage of maintaining the therapeutic properties of human milk. These works are a first report of human milk drying intended for preservation and to its nutritional content 30. These works are a first report of human milk drying intended for preservation and to its nutritional content. Human milk was obtained of the Human Bank Milk from the Hospital Civil of Guadalajara, Mexico where this study was also approved by the Ethical Research Committee in May 2015. Volunteer donors provided a written agreement about the donation of excess human milk by healthy mothers through informed consent where they accepted to participate voluntarily. The collected frozen milk in the storage was thaw and divided into three batches. First part was heat pasteurized (P) at 85°C for 5 min (Heidolph Laborota 4000, U.S.A.). Second part was treated with high pressure (HPP) (Avure Technologies ®, U.S.A.) at 300 MPa, for 10 min, 45°C. Both treatments were spray-dried (D) in a BÜCHI Mini Spray Dryer (B-29, Switzerland), air inlet temperature 165°C, and air outlet temperature 80°C. The third batch was spray-dried and separated in three parts: first one treated with UV-C radiation (UV-C), second with γ-irradiation and third part without subsequently treatment. UV-C was irradiated at 254 nm wavelength for 2 h (INDELAB 30/70 Serie RV ®, Spain), γ- irradiation treatment (G) was done at the Canadian Irradiation Center (CIC) using an underwater irradiator UC-15A (dose rate: 0.3675 kGy/min) equipped with a 60Co source (Nordion Int. Inc., Kanata, ON, Canada) at 10 kGy. HT-29 (ATCC HTB-38) cell line was purchased from American Type Culture Collection (ATCC, Manassas, VA, USA). The cell lines were cultivated in 25 cm2 cellular flasks (Corning, Manassas, VA, USA) in a humidified incubator (Thermo Scientific, Single Tri-gas 184L incubator, U.S.A) at 37°C under an atmosphere of 5% CO2 and 95% air. HT-29 (human colon cancer cells) cells were grown in MEMF/12 media containing 0.1% essential amino acids, 0.1% sodium pyruvate, 0.1% antibiotic and 10% (v/v) FBS. Cell maintenance was performed at a confluence of 80-90% by washing adherent cells with HBSS solution. Cells were then treated with 1X trypsin for exactly 12 min in a humidified incubator as mentioned above and inoculated into 5 mL fresh complete media. The antiproliferation of HT-29 cells was evaluated following the procedure of Prochaska and Santamaria 31 and Talalay 32. HT-29 cell line was cultivated with the medium described above. After a trypsinization cell count, 105 cells /100μL, were seeded per well following this loading order: column 1, blank (only fresh medium); column 2, negative control (10 μL diluent + 90 μL fresh medium); columns 3 to 12, samples (10 μL sample + 90 μL fresh medium). After 48 h of incubation at 37°C in an atmosphere of 5% CO2, 95% air, the media were carefully removed and 200 μL fresh media and 25 μL MTT solution (5 mg/mL PBS) were added to all wells. The plates were wrapped with aluminum foil and incubated 4 h at 37°C in an atmosphere of 5% CO2, 95% air. Only 200 μL media were removed, and 200 μL DMSO and 25 μL glycine buffer added, this being repeated 10 times to homogenize the resulting solution. After 30 minutes of incubation, the plates were read at 562 nm. Two mL of xanthine solution (1mM), 15 mL XTT (1mM) and 2 mL EDTA (1mM) were mixed and then filled up to 20 mL with sodium carbonate buffer (50mM, pH 10.2). A quantity of 30 µL of xanthine oxidase was added to obtain a concentration of 3 mU/mL 33. Twenty µL dilution solvent (10% DMSO), 20 µL SOD (30 U/mL) and 20 µL samples were added in the appropriate columns. In all columns, 180 µL reaction mixture was added, except for the blank column where 200 µL were added. All wells were shaken on a microplate for around 20 min at 200 rpm, and the absorbance was read at 480nm after 20 min of reaction. Antiradical scavenging activity was evaluated using DPPH test 34. A solution containing 3.14 mg of DPPH was dissolved in 200 mL of methanol (99%). Standard curves of Trolox and ascorbic acid using six concentrations were used as a reference (0 µM, 10 µM, 20 µM, 30 µM, 40 µM, 50 µM, and 60 µM) for reacting with the DPPH radical. The test examined 250 µL of sample reacting with 1 mL DPPH solution within a reaction time of 1 hour. One mL was taken and measured in a UV spectrometer (Scinco, S-3100, Lab Pro Plus Software, Korea) at 517 nm. 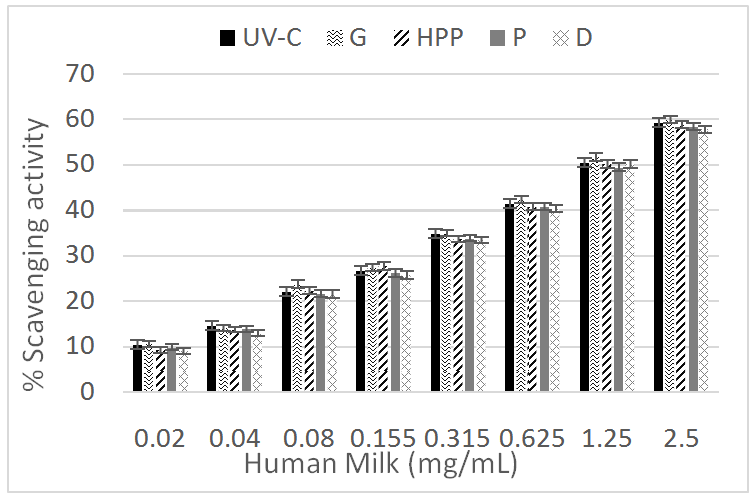 Figure 1 shows the percentage of growth inhibition respect to different concentrations of human milk powder that reached CI50 (inhibition concentration) to be 1.25 mg/mL to 2.5 mg/mL, except with P whose values were significantly lower than the other treatments (p < 0.05). In the case of human milk at a 0.625 mg/mL, concentration treated with UV-C, 50.25% inhibition growth was attained; for the other treatments values a percentage of inhibition of 48.73% treated with HPP, 48.5% spry-dried and 22.31% with P and D.
The CI50values for 1.25 mg/mL were 67.65%, 67.5%, 22.7% and 68.7% for UV-C, HPP, P and D respectively, whose the value of P was significantly lower than all other treated samples (p≤0.05). For 2.5 mg/mL milk concentration, the CI50 values of UV-C, HPP and D were 98.14%, 97.15%, 98.73% (SD ±37.4) respectively, while a CI50 value of 23.03% on heat pasteurized human milk sample was observed. There were significant differences between P and other treatments (p ≤0.05). Figure 1. 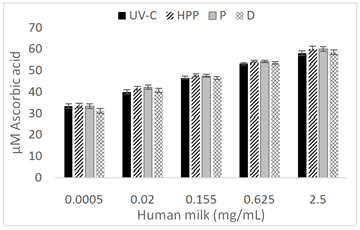 Percentage of growth inhibition of HT-29 cells when put in contact with human milk samples treated with different treatments: UV-C irradiation, HPP (High Pressure Process), P (heat Pasteurization), D (Spray Drying). The most common methods used for food preservation are thermal treatments like heat pasteurization and sterilization, which have been seen to significantly reduce microbial levels and growth, but often they result in undesired changes in foods, such as loss of biological activity, nutritional values and characteristics related with flavor and smell, all of which reduce freshness and quality of the final product 35. For example, a loss of nutrients of up to 20% vitamin C and 16% ascorbic acid has been reported 36. Such was the present case for the antiproliferative activity in heat pasteurized milk (Figure 1) that did not reach CI50 at any of the concentrations examined. Thermal application of both pasteurization and spin drying could have caused a loss in the inhibition of HT-29 cancer cells. Although there was no significant difference between UV-C, HPP and D, a higher percentage of inhibition of HT-29 cells was obtained on samples treated with UV-C. In the search for an alternative to pasteurization, it is possible to consider the treatment of human milk with UV-C or HPP. HPP has been recommended as a potential alternative to heat pasteurization for treating donor human milk 34, 37, and recently this technology has been increasingly used in industry for a wide range of products such as vegetables, meats, seafood, fish, fruits, purées and dairy products 35. It has been seen that HPP at 400-500 MPa, 5 min, 12°C, maintains the immunological protective activity associated with IgA antibodies and has a higher IgA retention than P 37. The only human milk enzyme that has been analyzed with HPP is lysozyme, but some studies of bovine milk treated with HPP have revealed that most indigenous milk enzymes like plasmin, alkaline phosphatase, lactoperoxidase, xanthine oxidase, phosphoisomerase, gamma-glutamyltransferase, and lipase are quite baroresistant up to 400 MPa 38. In the present study, the results showed that antioxidant activity in human milk powder was not affected by the different treatments applied; even heat pasteurization, a thermal treatment that can imply a decrease in antioxidant properties, but, in some studies it has been found that human milk properties can be maintained after thermal treatments 36, 39 and could be an option, because in this study antioxidant activity was maintained. Ultimately, any of the 4 treatments could be considered. 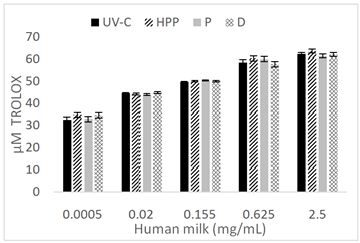 It has been found that UV-C irradiation processing in fresh-cut fruits leads to an increase in antioxidants 39, but in the experiment presented here, human milk treated with UV-C irradiation had lower scavenging activity in comparison to milk treated with HPP and P, although there was no significant difference between the 4 treatments, thus, all of them could be considered a good option. As has been reported, an excessively reactive oxygen species, especially the superoxide anion, has been related with hypertension and atherosclerosis diseases, and superoxide dismutase is an important key factor in defense of this anion 40. Therefore, to ascertain its presence in human milk after different treatments points to the preservation of this natural antioxidant. Figure 2 shows the percentage of scavenging activity against the superoxide anion, where human milk treated with G showed significantly higher activity against the O2 anion (95% confidence level) in comparison with the other treatments (p<0.05), followed by UV-C, HPP, D and P. D samples being significantly lower than G treated samples (p<0.05). Concentrations of 1.25 mg/mL to 2.5 mg/mL for all treatments reached middle of scavenging concentration (SC50), except in the case of heat pasteurized human milk at a 1.25 mg/mL concentration where a value of 49.38% scavenging activity was recorded. At a 2.5 mg/mL concentration of human milk, scavenging activities of 59.24%, 59.81%, 58.83%, 58.41% and 57.79% were observed for samples treated with UV-C, G, HPP, P and D respectively. 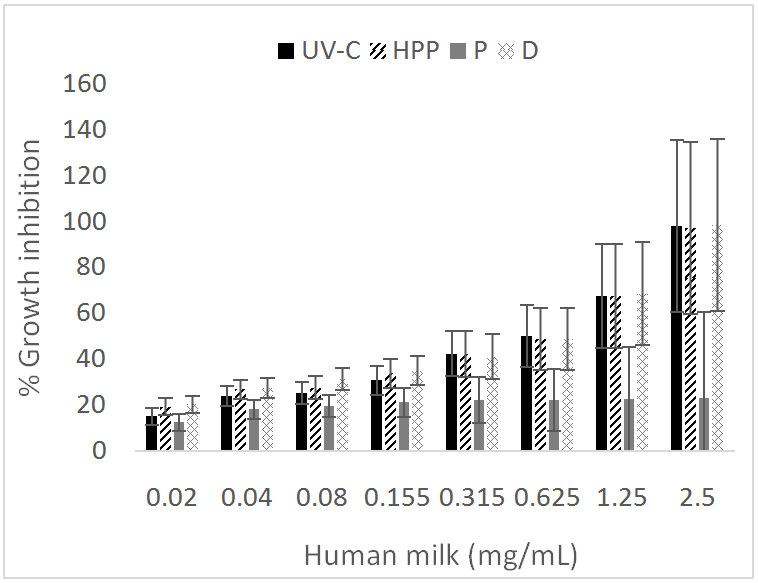 In the superoxide dismutase test, human milk treated with UV-C irradiation showed high scavenging activity in comparison with HPP, P and D treatments, but lower than G, so that the UV-C process would be important to be considered for treating human milk in the HMB, as it is easy to apply at very low cost 41. Some studies have found that foods treated by gamma irradiation in general are as nutritious, or more so, than the same food treated by conventional methods, like heating, drying or freezing. There is no significant effect on macro-nutrients in food (proteins, lipids, carbohydrates) but in the case of micronutrients, like vitamins, G could reduce them, but less than with other common food treatments. Any preparation process, whether cooking, baking or irradiation, could affect the taste of food if not properly applied. Studies have also highlighted the importance of SODs for their ability to manage the oxidative state of the cell because they inhibit signals for pancreatic cancer growth 21. 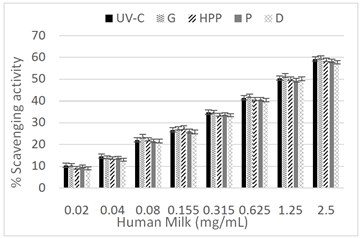 The results of antiradical scavenging test for different treatments of human milk powder are shown in Figure 3. Results showed very similar values (95% confidence level) with no significant difference between the 4 treatments (p > 0.05). The sample of human milk that presented the highest antioxidant activity was milk treated with HPP before the drying process. At the 0.625 mg/mL concentration of milk values of 53.83%, 54.79%, 54.37%, 54.39% and were observed at 2.5 mg/mL concentration values of 58.99%, 59.61%, 59.03%, 59.31%, were respectively observed of UV-C, HPP, P, and D. Being a non-thermal method, HPP could be an alternative option for the treatment of human milk as it has been observed that this method does not affect the covalent bonds of food components or sensory properties, and nutrients or bioactive compounds suffer no significant losses, the opposite of the frequent highly damaging effects of thermal treatments 37, 42, 43. Results of antiradical scavenging activity of human milk at different concentrations are presented in Figure 4 compared with μM ascorbic acid. With HPP treatment, a higher antioxidant activity than other treatments is seen, most clearly observed in the 2.5 mg/mL concentration, with values of 58.09%, 60.2%, 60.18% and 58.62%, for UV-C, HPP, P and D treated samples respectively. However, there was no significant difference between the 4 treatments (p > 0.05), meaning that any of the treatment has the ability to preserve antiradical scavenging. Despite treatments applied to human milk for its conservation, it still keeps its biological properties. It is important to mention that except for heat treatment, all pasteurization treatments evaluated in this study showed that samples maintains good microbiological quality, although it could affect biological activity. Thermal processes can damage milk properties; therefore it would be necessary to replace this method for another one able to preserve milk freshness and good quality. The treatment of human milk treated with high pressure showed antiproliferative activity and antioxidant activity. On the other hand, UV-C radiation and γ-irradiation treatments showed higher antiproliferative activity and also higher scavenging activity against the superoxide anion than with other treatments. Therefore, high pressure and irradiation treatments (UV-C or γ-irradiation) could be considered as best treatments for the preservation of biological properties in human milk. We thank the National Council of Science and Technology of Mexico (CONACyT) and the Fond Ministere des Relations Internationals du Quebec (MRI), for the financial support for the development of this research work. We also thank the critical reading of Patricia M. Hayward-Jones M Sc. And Dulce Ma. Barradas-Dermitz M.S. There is no conflict of interest between the authors. Landers, S., Hartmann, B.T. “Donor human milk banking and the emergence of milk sharing”. Pediatr Clin North Am. 60: 247-260. (2013). Arslanoglu, S., Corpeleijn, W., Moro, G., Braegger, C., Campoy, C., Colomb, V., Decsi, T., Domellöf, M., Fewtrell, M., Hojsak, I., Mihatsch, W., Mølgaard, C., Shamir, R., Turck, D., van Goudoever, J. “Donor human milk for preterm infants: current evidence and research directions”. J Pediatr Gastroenterol Nutr. 57(4):535-542. (2013). Quigley, M., McGuire, W. “Formula versus donor breast milk for feeding preterm or low birth weight infants”. Cochrane Database Syst Rev. 4. (2014). World Health Organization (WHO). “In the Global Strategy for Infant and Young Child Feeding”. http://www.who.int/nutrition/topics/global_strategy_iycf/es/ (Last checked on November 23th 2016. (2014). Pino, V.J.L., López, E.M.A., Medel, I.A.P., Ortega, S.A. “Factores que inciden en la duración de la lactancia materna exclusiva en una comunidad rural de Chile.” Rev. Chilena Nutr. 40. (2013). Neville, M.C. Sampling and storage of human milk. In: Jensen RG, ed. Handbook of milk composition. San Diego (CA) Academic Press. (1995).64-79. Emmett, P.M., Rogers, I.S. “Properties of human milk and their relationship with maternal nutrition” .Early Hum. Dev. 49 (Supplement (0)) S7-S28. (1997). Eritsland, J. “Safety considerations of polyunsaturated fatty acids”. Am. J. Clin. Nutr. 71, 197S 201S. (2000). Valenzuela, A., Nieto, S. “Ácido docosahexaenoico (DHA) en el desarrollo fetal y en la nutrición materno-infantil”. Rev Med Chil. 129:1203-1211. (2001). Morales, E. “Ácidos grasos poliinsaturados de cadena larga en la nutrición del lactante”. Rev. Hosp. Mat. Inf. Ramón Sardá. 2: 73-75. (1994). Carver, J. “Advances in nutritional modification of infant formulas”. Am. J. Clin. Nutr. 77, 1550-1554. (2003). Marild, S., Hansson, S., Jodal, U., Oden, A., Svedberg, K. “Protective effect of breastfeeding against urinary tract infection”. Acta. Paediatr. 93(2):164-168. (2004). Arenz, S., Ruckerl, R., Koletzko, B., von Kries, R. “Breast-feeding and childhood obesity–a systematic review”. Int. J. Obes. Relat. Metab. Disord. 28(10):1247-1256. (2004). Boyd, C.A., Quigley M.A., Brocklehurst P. “Donor breast milk versus infant formula for preterm infants: systematic review and meta-analysis”. Arch. Dis. Child Fetal. Neonatal. Ed. 92. (3): F169-175. (2007). Heiman, H., Schanler, R.J. “Enteral nutrition for premature infants: The role of human milk”. Semin. Fetal Neonatal. Med. (1): 26-34. (2007). Ledo, A., Arduini, A., Asensi, M.A., Sastre, J., Escrig, R., Brugada, M., Aguar, M., Saenz, P., Vento, M. “Human milk enhances antioxidant defenses against hydroxyl radical aggression in preterm infants”. Am. J. Clin. Nutr. 89(1): 210-215. (2009). Ministerio de salud y protección social. Available from: https://www.minsalud.gov.co/Documentos%20y%20Publicaciones/Bancos%20de%20lech %20humana.pdf (Last checked on Feb 12th 2017). (2012). Hanna, N., Ahmed, K., Anwar, M., Petrova A., Hiatt, M., Hegyi, T. “Effect of storage on breast milk antioxidant activity”. Pub. Med. 89: 518-520. (2004). Slutzah, M., Codipilly, C. N., Potak, D., Clark, R., M., Schanler, R. J. “Refrigerator storage of expressed human milk in the neonatal intensive care unit”. J Pediatr. 156(1):26- 28. (2010). Salcedo, J., Gormaz, M., López, M.M.C.¸ Nogarotto, E., Silvestre, D. (2015). “Human milk bactericidal properties: Effect of Lyophilization and Relation to Maternal Factors and Milk Components”. Journal of Pediatrics Gastroenterology & Nutrition. 60 (4):527-32. (2010). Dominguez, L., Parzanese, M. “Luz ultravioleta en la conservación de los alimentos”. Available from: http://copal.org.ar/wp-content/uploads/2015/06/luzultravioleta.pdf Accessed 11 December 2017. (2011). Wetherill, J.M. “Gamma irradiation of food”. Canadian Journal of Public Health. (12): 521-524. Viazis, S., Farkas, B.E., Jaykus, L.A. “Inactivation of bacterial pathogens in human milk by high pressure processing”. J. Food Prot. 71(1):109-18. (2008). Cheftel, J. C. Review: “High-pressure, microbial inactivation and food preservation”. Food Sci Technol. Int. 1, 75-90. (1995). Yanza, H.E.G. “Diseño de un secador por atomización a nivel piloto para jugo concentrado de tomate de arbol”. http://www.bdigital.unal.edu.co/1025/1/erickgermanyanzah..pdf. (Last checked on February 01st 2018. (2003). Guardiola, R.F. “Elaboración de bases lácteas mediante secado por atomización para fabricación de chocolate”. http://digibuo.uniovi.es/dspace/bitstream/10651/32386/7/TFM_EvaGuardiola.pdf . (Last checked on February 01st 2018). (2015). Geankoplis, C. Procesos de transporte y operaciones unitarias (3ª ed.). México: Compañía Editorial Continental. Giraldo G.G.I. 1999. Métodos de estudios de vida de anaquel de los alimentos. Work to obtain post of Associate Professor.1-106. (1998). Cavazos-Garduño A., Serrano-Niño J.C., Solís-Pacheco J.R., Gutiérrez-Padilla J.A, González-Reynoso O., García H.S., Aguilar-Uscanga B.R. Effect of Pasteurization, Freeze-drying and Spray Drying on the Fat Globule and Lipid Profile of Human Milk. Journal of Food and Nutrition Research. 4(5): 296-302. ISSN: 1338-4260. (2016). Castro-Albarrán Jorge, Aguilar-Uscanga Blanca Rosa, Calon Frédéric, St-Amour Isabelle, Solís-Pacheco Josué, Saucier Linda, Ratti Cristina. Spray and Freeze Drying of Human Milk on the Retention of Immunoglobulins (IgA, IgG, IgM). Drying Technology An International Journal. 43(15): 1801-1809. (2016). Castro-Albarrán Jorge, Navarro-Hernández Rosa-Elena, Solís-Pacheco Josué, Salazar-Quiñones Itza-Carmina, Macías-López Griselda, Barrera-De León Juan-Carlos, Aguilar-Uscanga Blanca-Rosa. Impact of pasteurization/ freeze-drying on content available of immunoglobulins of the mature human milk. Study to using into human milk banking of hospitals. Nutrición Hospitalaria. 34(4):899-906. (2017). Prochaska, H.J., Santamaria, A.B. “Direct measurement of NAD(P)H: quinone reductase from cells cultured in microtiter wells: a screening assay for anticarcinogenic enzyme inducers”. Pub. Med.169 (2):328-36. (1988). Talalay, P.” Mechanisms of induction of enzymes that protect against chemical carcinogenesis”. Pub. Med. 28:237-50. (1989). Carter, W.O., Narayanan, P.M.K., Robinson, J.P. Intracellular hydrogen peroxide and superoxide anion detection in endothelial cells. Journal of Leukocyte Biology. 55 (2): 253-8. (1994). Blois, M.S. “Antioxidant determinations by the use of a stable free radical”. Nature. 181: 1199-1200. (1958). Hogan, E., Kelly, A.L., Sun, D.W. “High pressure processing of foods: An overview. In: Emerging Technologies for Food Processing”. Sun, D.-W. Eds., San Diego: Elsevier Academic Press. 3-32. (2005). Moltó, P.C., Permanyer, M., Castellote, A.I., López, S.M.C. “Effects of pasteurization and high-pressure processing on vitamin C, tocopherols, and fatty acids in mature human milk”. Food Chemistry. 124: 697-702. (2010). Sousa, G.S., Delgadillo, I., Saraiva, A.J. “Human milk composition and preservation: evaluation of high pressure processing as a non-thermal pasteurization technology”. Critical Reviews of Food Science. 56: 1043-1060. (2016). Huppertz, T., Smiddy, M.A., Upadhyay, V.K., Kelly, A.L. “High pressure- induced changes in bovine milk: a review”. Int. J. Dairy Technol. 59(2): 58-66. (2006). Correia, I., Nunes, A., Saraiva, J.A., Barros, A.S., Delgadillo, I. “High pressure treatments largely avoid/revert decrease of cooked sorghum protein digestibility when applied before/after cooking. LWT”. Food Sci. Technol. 44(4): 1245-1249. (2011). Silvestre, D., Miranda, M., Muriach, M., Almansa, I., Jareno, E., Romero, F.J. “Antioxidant capacity of human milk: Effect of thermal conditions for pasteurization”. Acta Paediatr. 97: 1070-1074. (2008). Fukai, T., Ushio, F.M. “Superoxide Dismutases: Role in redox signaling, vascular function, and diseases”. Antioxidant Redox Signaling. 15(6):1583-1606. (2011). Alothman, M., Bhat, R., Karim, A.A. “UV radiation-induced changes of antioxidant capacity of freshcut tropical fruits”. Innovative Food Science & Emerging Technologies. (10): 512-516. (2009). Kumar, S.P., Verma, A.K., Ranjan, R., Pal, Singh, T., Kumar, D., Kumar, P. “Non-thermal preservation of meat by irradiation: a review”. Journal of Food Research and Technology. (3): 7-13. (2014). Arreola, Ariana Rodríguez, et al. "Assessment of the Biological Activity in Human Milk Power Treated with Different Processes for Their Conservation." Journal of Food and Nutrition Research 6.5 (2018): 329-334. Arreola, A. R. , Lacroix, M. , Pacheco, J. R. S. , Morales, E. G. , Padilla, J. A. G. , Castellanos, E. A. , Sánchez, J. A. R. , & Uscanga, B. R. A. (2018). Assessment of the Biological Activity in Human Milk Power Treated with Different Processes for Their Conservation. Journal of Food and Nutrition Research, 6(5), 329-334. Arreola, Ariana Rodríguez, Monique Lacroix, Josué Raymundo Solís Pacheco, Elisa García Morales, José Alfonso Gutiérrez Padilla, Eusebio Angulo Castellanos, Juan Arturo Ragazzo Sánchez, and Blanca Rosa Aguilar Uscanga. "Assessment of the Biological Activity in Human Milk Power Treated with Different Processes for Their Conservation." Journal of Food and Nutrition Research 6, no. 5 (2018): 329-334.